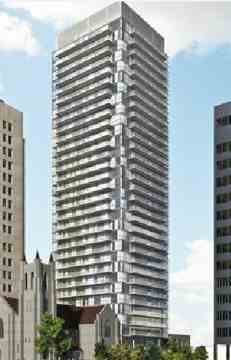 Blue Diamond at Imperial Plaza Condos is a new condo and townhouse development by Camrost-Felcorp currently in preconstruction at 129 St Clair Ave W in Toronto. Blue Diamond at Imperial Plaza Condos designed by Diamond Schmitt Architects, heritage architecture by ERA Architects and landscaping by Janet Rosenberg + Studio. Grounded in history and superb design in the prestigious Deer Park community. The former Deer Park United Church will be creatively adapted into a public courtyard with retail along St. Clair, townhouses on Foxbar, and a stunning tower affording exceptional views of the city. The former Deer Park United Church will be creatively integrated into the development, a stunning 28-storey tower affording exceptional views of the city. 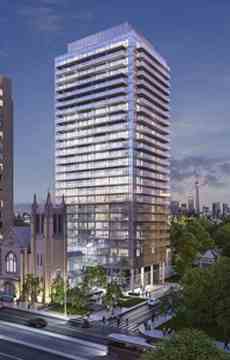 One of the more interesting features of this development is the neighbouring Deer Park United Church. The church is being adapted into a build courtyard with neighbourhing retail and townhomes, making a clever compliment of old and new.